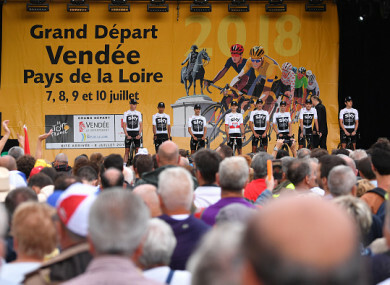 Spectators in attendance at a Tour de France presentation did not give the defending champion a warm welcome. CHRIS FROOME WAS whistled and booed as he took to the stage for the Tour de France’s team presentation on Thursday. Froome returned an adverse finding for the asthma drug salbutamol at last year’s Vuelta a Espana, which had left the defence of his Tour title in jeopardy. An investigation followed, but Froome was allowed to continue competing and was cleared of any wrongdoing by the International Cycling Union and WADA on Monday. However, Froome was greeted with an unfriendly welcome by the spectators in La Roche-sur-Yon. Most of the teams participating in this year’s race were well received, but the same could not be said for Sky, who were jeered from the outset. Unlike the team leaders for the other squads, Froome was not interviewed on stage and opted not to stop for the waiting media. Instead he made his way onto the two-kilometre welcome course, but the reception was far from friendly. Froome, who is aiming to win a record-equalling fifth Tour, insisted he was not worried by the backlash at Sky’s pre-race media event on Wednesday. Email “Chris Froome booed and whistled at Team Sky's Tour de France presentation ”. Feedback on “Chris Froome booed and whistled at Team Sky's Tour de France presentation ”.